I&apos;ll admit, this whole pumpkin spice craze has gotten a little out of hand. Take a trip to any grocery store this time of year and you&apos;ll see pumpkin spice cookies, pumpkin spice granola bars, pumpkin spice chewing gum and even pumpkin spice yogurt. Browse Pinterest and there are recipes for roasted pumpkin seeds, pumpkin waffles, pumpkin macaroni and cheese and homemade pumpkin pop tarts. That&apos;s a lot of pumpkin. This obsession really started with the Starbucks Pumpkin Spice Latte, which was introduced in 2003. Over the past 12 years, the drink has become tremendously popular. I even have friends that simply call it the PSL. 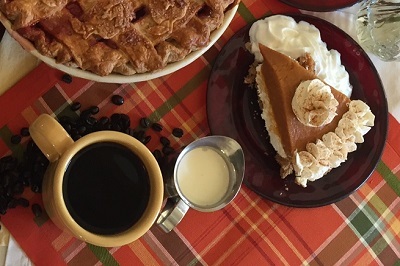 I love the PSL, as well as Starbucks&apos; pumpkin bread, but when I started doing some research for this story, I found that their pumpkin spice treats pale in comparison to what&apos;s available at locally-owned restaurants in Hendricks County. Take The Beehive in Danville, for example. I stopped by this quaint market/coffee shop recently and tried a pumpkin muffin and pumpkin chai for breakfast and immediately became a huge fan of this local establishment. 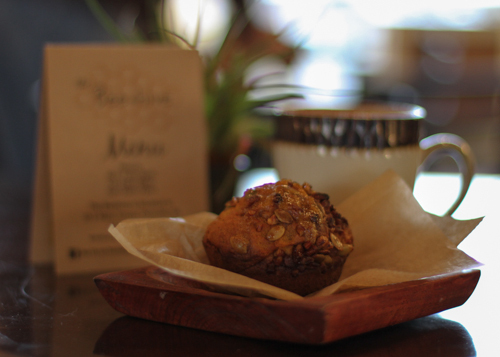 The muffin, warmed to the perfect temperature, was to die for, mostly due to the warm pumpkin-sugar glaze and crunchy pumpkin seeds and pecans on top. The pumpkin chai, served in a ceramic mug, was the perfect drink on a cool, fall day. Plus, the atmosphere of the restaurant was incredibly cozy. Just down the road, another gem in Hendricks County, The Bread Basket Cafe & Bakery, serves a wide variety of pumpkin confections, including a few different versions of pumpkin pie, pumpkin cinnamon rolls and more. My husband, daughter, and I enjoyed lunch there one recent Saturday. After having their Summery Grilled Cheese and Southwest Chicken Soup, I ordered the Pumpkin Torte for dessert. This sweet dessert has several layers of pumpkin cake that alternates with layers of cream cheese filling and is topped with crunchy pecans and a caramel drizzle. I was in culinary heaven. We knew we would see my dad later that night to celebrate his birthday, so we were sure to get him a slice of the pumpkin crunch pie to go. He raved about this version of one of his favorite desserts, the traditional pumpkin pie. and wished he could have had another piece. Here&apos;s a list of more pumpkin spice treats that you can find right now in Hendricks County. Court House Grounds on the Square in Danville offers a different spin on the PSL, a white chocolate pumpkin spice latte. Grab a bag of autumn spice popcorn from Heidi Pops Gourmet Popcorn in The Shops at Perry Crossing, formerly Metropolis, in Plainfield for an afternoon snack. Hilligoss Bakery in Brownsburg offers a pumpkin cream cheese muffin. For a cold treat, try a pumpkin milkshake at Plainfield&apos;s Oasis Diner. This 1950s-style diner also makes a pumpkin cheesecake. Adults can even try a pumpkin-flavored beer, the Jack-O Traveler, at Scotty&apos;s Brewhouse in Brownsburg.